Before CALMS sends out short-term teams to serve in Central America, we invite the team leaders to participate in a Get to Know the Mission trip. These regularly held events include 10 - 12 people and are designed to help leaders get to know CALMS' mission philosophy, meet their cultural helpers (our CALMS' staff and partners in the field), visit potential mission sites, and participate in on-field activities and training that lasts about eight days. This training is designed to help leaders become more confident and to plan their future ministry with their team. These trips are also used to help new leaders and their congregations choose the community or ministry they will focus on for the next five years with the goal of helping that community or church become healthier. Before you and your mission team leave for the mission field, you will want to pray and study God's Word together and read through the key pages of the CALMS GO! BOOK which is given to all CALMS' volunteers prior to visiting the mission field. Teams are strongly encouraged to prepare a team covenant to guide how they live and serve on the mission field. CALMS also sends a growing number of interns and individual volunteers who serve from one or two months to eighteen months. 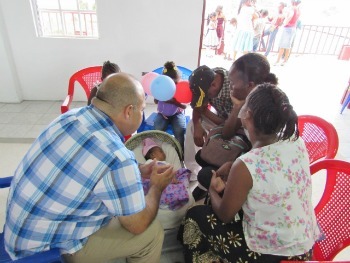 CALMS works with our Central American partners to find the right fit and helps develop covenants and job descriptions to guide the relationships for maximum effectiveness. For more information contact CALMS at calms@calms.org.